Click Here to see all submittals. Our memorable and record 50th Reunion is now history! Some 500 classmates, spouses and guests gathered in Ithaca on June 9-12, 2011 to celebrate the 50th anniversary of our graduation. Thanks to our Reunion Co-Chairs: Pauline Sutta Degenfelder, Carol Gittlin Franklin, Doug Uhler and Neil Goldberger for organizing a terrific four days of events. Thanks also to Ed Goldman, Jon Greenleaf and Lassie Eicher for producing a fabulous Reunion Yearbook. 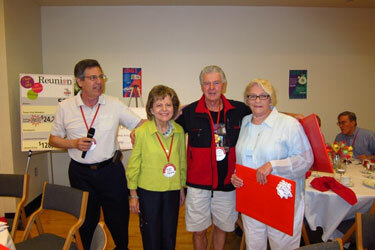 We presented a class record Reunion gift of $24,214,798 to Cornell. See all the results of our 50th Reunion Campaign. Read Reunion report by our class correspondents. See Reunion Photos Submitted To-Date. Send photos taken during our 50th Reunion (jpg format) to the Webmaster for posting on our class website. Carol Franklin presents gift from the class to outgoing Class President Marshall Frank. Marshal Frank presents gifts to Reunion Co-Chairs Pauline Degenfelder, Doug Uhler and Carol Franklin.